This includes writings about gardening, teaching, spirituality, and daily life. Short stories will come soon. 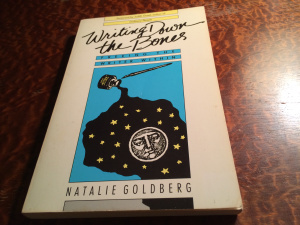 Through this book, Natalie Goldberg taught me a whole lot about spilling everything on to the page and finding material from the result. When I named the blog Writing Practice, I was using her ideas. For that reason, this picture and explanation should go in the header, but I haven’t figured out how to get it there as a thumbnail image. So, Natalie, I do not want to plagiarize you, but right now, this is my best shot at fairness. You go, Girl; you’re off to a great start. Thank you! Your blogs are wonderful and creative. I hope to learn how to make things vaguely presentable and try to post once a week or so. Wonderful and creative will take practice–your discipline is amazing. Couldn’t have done with without my beta readers to get me started.